Dwayne Johnson attends the European Premiere of 'Rampage' at Cineworld Leicester Square on April 11, 2018 in London, England. The actor recently shared news of the birth of his third daughter. 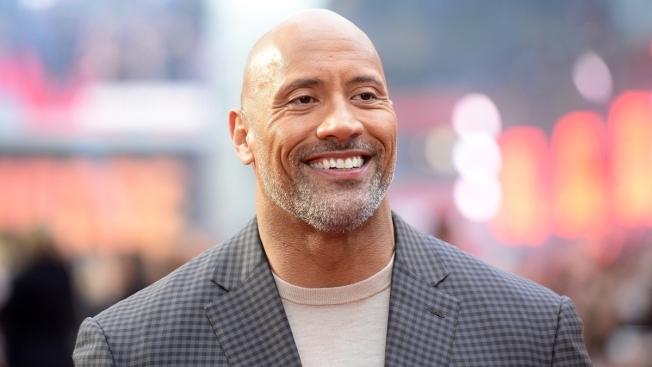 Dwayne Johnson is a dad again — and even more outnumbered by girls. The 45-year-old star shared on social media Monday that his longtime partner, Lauren Hashian, recently gave birth to a baby girl named Tiana. This is the couple's second daughter together and his third overall. Johnson and Hashian, 33, are parents to Jasmine, 2. He also has a 16-year-old daughter, Simone, from a past marriage. Johnson revealed Hashian's most recent pregnancy in December and said they were expecting another baby girl. "It's a girl. I can't make boys, but I keep trying to — that's the fun part!" Johnson joked earlier this month on The Graham Norton Show in the U.K.
Johnson and Hashian have been together for more than 10 years. The actor told Rolling Stone earlier this month that the two had planned to get married this spring in Hawaii. "But then we got pregnant," he said. "And Mama don't wanna take wedding pictures with a big belly — Mama wanna look good." He said the two did not plan on having another child together but "were talking about it." "And then all of a sudden I get a text from her with a [picture of a] pregnancy test," he said, joking, "All I did was look at her. 'Guess what. You're pregnant. Baby in you now.'" Johnson and Hashian also told Rolling Stone that they were thinking about naming their baby girl Tia. "It's simple, it's Polynesian-ish," Hashian said. "And I feel like she might come out looking like a Tia. I mean, she could come out any which way, because we're complete opposites." "We were having dinner with Emily Blunt, who I'm getting ready to work with [on Disney's Jungle Cruise], and I said, 'What do you think of Tia?'" Johnson said. "And she went — beat, beat, beat — 'No one's gonna f--k with a Tia Johnson.'"